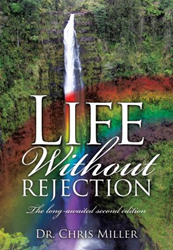 Dr. Chris Miller’s new book, Life Without Rejection, ($19.49, paperback, 9781498465007), is a guide to healing for those who have spent their lives suffering from rejection and a must-have resource manual for those who work with the rejected. The original book, published online, targeted those suffering from rejection and according to the author, received an abundance of positive feedback and over 1,000,000 hits. This book includes those same powerful tools to help activate the weapons of warfare and see the darkness of rejection lifted during prayer. The measures are not complicated and do not require repeated visits. The author instructs readers to simply pray as the Apostles did – to lay hands, pray, and set people free. This is a very unique book. The author’s training ground was in supernatural experiences with her demon-possessed husband. Through this, the Lord taught her many lessons about how the kingdom of darkness works. Dr. Chris Miller has a PhD in Communications from Regent University and is currently employed by Meijers, Inc. She is a retired university professor and care pastor who now does substance abuse classes for a prison ministry outreach. Dr. Lester Sumrall anointed her ministry in 1988 when she was a new Christian, and shortly after, an evangelist in her church prayed for her gifts. When they relocated to Michigan, while awaiting her husband’s deliverance, she took classes to qualify as a Care Leader in her church. With “Victory in ‘93” she went into the fields of Substance Abuse and altar ministries, where she has remained, including the years she was Care Pastor at an inner city church. Dr. Miller is available for speaking in your choice of venues on any of the topics in this book. Please feel free to contact her at drchris(at)drchrisamiller(dot)com or through her blog at http://church-of-the-outcasts.com. Xulon Press, a division of Salem Media Group, is the world’s largest Christian self-publisher, with more than 15,000 titles published to date. Retailers may order Life Without Rejection through Ingram Book Company and/or Spring Arbor Book Distributors. The book is available online through xulonpress.com/bookstore, amazon.com, and barnesandnoble.com.